UN School In Gaza Bombed by Israel; 17 Dead, hundreds wounded; Even the Obama Administration, which gave the green light for this Israeli offensive, and has re-armed Israel with mortar shells and bullets, has been forced to condemn. THERE WAS this village in England which took great pride in its archery. In every yard there stood a large target board showing the skills of its owner. On one of these boards every single arrow had hit a bull’s-eye. In this war, our government does the same. We achieve all our goals – but our goals change all the time. In the end, our victory will be complete. WHEN THE war started, we just wanted to “destroy the terror infrastructure”. Then, when the rockets reached practically all of Israel (without causing much damage, largely owing to the miraculous anti-missile defense), the war aim was to destroy the rockets. When the army crossed the border into Gaza for this purpose, a huge network of tunnels was discovered. They became the main war aim. The tunnels must be destroyed. Tunnels have been used in warfare since antiquity. Armies unable to conquer fortified towns tried to dig tunnels under their walls. Prisoners escaped through tunnels. When the British imprisoned the leaders of the Hebrew underground, several of them escaped through a tunnel. Hamas used tunnels to get under the border walls and fences to attack the Israeli army and settlements on the other side. The existence of these tunnels was known, but their large numbers and effectiveness came as a surprise. Like the Vietnamese fighters in their time, Hamas uses the tunnels for attacks, command posts, operational centers and arsenals. Many of them are interconnected. For the population on the Israeli side, the tunnels are a source of dread. The idea that at any time the head of a Hamas fighter may pop up in the middle of a kibbutz dining hall is not amusing. So now the war aim is to discover and destroy as many tunnels as possible. No one dreamed of this aim before it all started. If political expedience demands it, there may be another war aim tomorrow. It will be accepted in Israel by unanimous acclaim. THE ISRAELI media are now totally subservient. There is no independent reporting. “Military correspondents” are not allowed into Gaza to see for themselves, they are willingly reduced to parroting army communiqués, presenting them as their personal observations. A huge herd of ex-generals are trotted out to “comment” on the situation, all saying exactly the same, even using the same words. The public swallows all this propaganda as gospel truth. The small voice of Haaretz, with a few commentators like Gideon Levy and Amira Hass, is drowned in the deafening cacophony. I escape from this brainwashing by listening to both sides, switching all the time between Israeli TV stations and Aljazeera (in Arabic and in English). What I see is two different wars, happening at the same time on two different planets. For viewers of the Israeli media, Hamas is the incarnation of evil. We are fighting “terrorists”. We are bombing “terror targets” (like the home of the family of Hamas leader Ismail Haniyeh). Hamas fighters never withdraw, they “escape”. Their leaders are not commanding from underground command posts, they are “hiding”. They are storing their arms in mosques, schools and hospitals (as we did during British times). Tunnels are “terror tunnels”. Hamas is cynically using the civilian population as “human shields” (as Winston Churchill used the London population). Gaza schools and hospitals are not hit by Israeli bombs, God forbid, but by Hamas rockets (which mysteriously lose their way) and so on. Seen through Arab eyes, things look somewhat different. Hamas is a patriotic group, fighting with incredible courage against immense odds. They are not a foreign force oblivious to the suffering of the population, they are the sons of this very population, members of the families that are now being killed en masse, who grew up in the houses that are now being destroyed. It is their mothers and siblings who huddle now in UN shelters, without water and electricity, deprived of everything but the clothes on their back. I have never seen the logic in demonizing the enemy. When I was a soldier in the 1948 war, we had heated arguments with our comrades on other fronts. Each insisted that his particular enemy – Egyptian, Jordanian, Syrian – was the most brave and efficient one. There is no glory in fighting a depraved gang of “vile terrorists”. Let’s admit that our present enemy is fighting with great courage and inventiveness. That almost miraculously, their civilian and military command structure is still functioning well. That the civilian population is supporting them in spite of immense suffering. That after almost four weeks of fighting against one of the strongest armies in the world, they are still standing upright. Admitting this may help us to understand the other side, something that is essential both for waging war and making peace, or even a ceasefire. WITHOUT UNDERSTANDING the enemy or having a clear concept of what we really want, even achieving a ceasefire is an arduous task. For example: what do we want from Mahmoud Abbas? For many years the Israeli leadership has openly disparaged him. Ariel Sharon famously called him a “plucked chicken”. Israeli rightists believe that he is “more dangerous than Hamas”, since the naïve Americans are more likely to listen to him. Binyamin Netanyahu did everything possible to destroy his standing and sabotaged all peace negotiations with him. They vilified him for seeking reconciliation with Hamas. As Netanyahu put it, with his usual talent for sound bites, “peace with us or peace with Hamas’. But this week, our leaders were feverishly reaching out to Abbas, crowning him as the only real leader of the Palestinian people, demanding that he play a leading role in the ceasefire negotiations. All Israeli commentators declared that one of the great achievements of the war was the creation of a political bloc consisting of Israel, Egypt, Saudi Arabia, the Gulf Emirates and Abbas. Yesterday’s “no-partner” is now a staunch ally. The trouble is that many Palestinians now despise Abbas, while looking with admiration upon Hamas, the shining symbol of Arab honor. In Arab culture, honor plays a far larger role than in Europe. At the moment, Israeli security experts look with growing concern at the situation in the West Bank. The young – and not only the young – seem ready for a third intifada. Already, the army fires live ammunition at protesters in Qalandia, Jerusalem, Bethlehem and other places. The number of dead and injured in the West Bank is rising. For our generals, this is another reason for an early ceasefire in Gaza. CEASEFIRES ARE made between the people who are firing. Viz: Israel and Hamas. Alas, there is no way around it. What does Hamas want? Unlike our side, Hamas has not changed its aim: to lift the blockade on the Gaza Strip. This can mean many things. The maximum: opening the crossings from Israel, repairing and reopening the destroyed airport of Dahaniyah in the south of the Strip, building a seaport at Gaza City (instead of the existing small fishing jetty), allowing Gaza fishermen to go further from the coast. The minimum would be to open the Israeli crossings for the free movement of goods in and out, allowing Gazans to go to the West Bank and beyond, and to support themselves with exports, an aspect which is too rarely mentioned. In return, Israel would certainly demand international inspection to prevent the building of new tunnels and the restocking of the arsenal of rockets. Israel would also demand some role for Abbas and his security forces, which are viewed by Hamas (and not only by them) as Israeli collaborators. The Israeli army also demands that even after a ceasefire comes into force, it will complete the destruction of all the known tunnels before withdrawing. IF THERE had been direct negotiations, this would have been comparatively easy. But with so many mediators vying with each other, it’s difficult. Last Wednesday, Haaretz disclosed an amazing piece of news: the Israeli Foreign Ministry – yes, the fief of Avigdor Lieberman! – proposes turning the problem over to the United Nations. Let them propose the conditions for the cease-fire. Assuming that a ceasefire is achieved (and not just a short humanitarian one, that no side intends to keep), what then? Will serious peace negotiations become possible? Will Abbas join as the representative of all Palestinians, including Hamas? Will this war be the last one, or remain just another episode in an endless chain of wars? I HAVE a crazy fantasy. Peace will come and filmmakers will produce movies about this war, too. One scene: Israeli soldiers discover a tunnel and enter it in order to clear it of enemies. At the same time, Hamas fighters enter the tunnel at the other end, on their way to attack a kibbutz. The fighters meet in the middle, beneath the fence. They see each other in the dim light. And then, instead of shooting, they shake hands. A mad idea? Indeed. Sorry. gas and oil off the coast of Gaza…of course on some level it does…only strengthens Israel’s commitment to the continued occupation of Gaza…reminds me of Algeria (in more ways than one) where oil and gas were discovered at Hassi Messaoud (SE Algeria) when the fighting between the French and Algerian rebels was already underway,…that discovery hardened French resolve to brutalize the Algerian people…in the end France won the war militarily against the rebels (any serious study of that war would conclude this) but lost the war politically because of its utter bestial brutality, extensive use of torture, murder against the Algerian people. France was forced to abandon its Algerian colony. Could gas and oil in Gaza have anything to do with the current conflict? I read that Abbas was talking to Russia about a deal for them to develop gas fields in the Palestinian territories. It’s perhaps early to speculate on the ownership of future gas resources, for the palestinians, while Netanyahu’s war machine still spinning out of control . 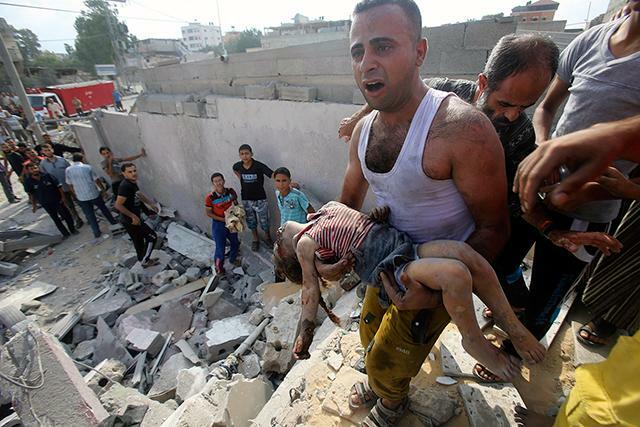 The so called High-Tech smart weapons proved to be as inaccurate as the self made rockets of the militants in Gaza . At least, in firing at random . Here is a remarkable testimony of IDF veterans, gathered by Ben Lynfield . Something that could perhaps inspire Avnery to explore further the movie idea he’s got in mind, whereby the happy end consists of soldiers entering from one end of a tunnel, and the militants from the other end . But before they meet in the middle, I for one, would suggest in this scene, the obvious soundtrack of “Beat It”, and having Van Halen go wild on his guitar . Once the two sides come face to face, anything can be the outcome of the scene . I did Drama school, and I know how crucial the director’s choice must be, when working on the climax of any particular scene . The meeting in the middle of the tunnel, needs a pre-calculated “Resolving”, as its called in screenplaywriting . Veterans have made their testimonies available to ‘The Independent’ to make a statement against the current fighting . Memories of his service along the Gaza border two years ago have been streaming through the mind of Shai Davidovich this week as he hears news from the crowded coastal enclave of heavy Palestinian civilian casualties from the devastating Israeli military campaign there. Mr Davidovich, 27, the educational director for an ex-soldiers’ group Breaking the Silence, served in field intelligence during Operation Pillar of Cloud, a previous Israeli war against Hamas in Gaza in 2012. He says he was repeatedly ordered to help prepare for the firing of artillery during the hostilities but that he thought it was “crazy’’ to use artillery in a crowded area, in this case the town of Beit Hanoun. Mr Davidovich’s colleagues in Breaking the Silence, which collects soldiers’ secret testimonies to try to enlighten the Israeli public as to the true nature of the army’s activities in the West Bank and Gaza. This week, alarmed at the civilian deaths in Gaza, it took testimonies from soldiers who served in previous Israeli operations in the region, including Mr Davidovich. They made the testimonies available to The Independent to make a statement against the current fighting. Operation Rainbow in 2004 is the earliest of the campaigns covered while Operation Cast Lead in 2008-09 and Operation Pillar of Defence in 2012 also feature. They do not include anything from the current conflict. “If you look at all the recent operations continuing into the current operation you see a moral descent that doesn’t stop and a military aggressiveness that only increases,’’ says Yehuda Shaul, the founder of Breaking the Silence. “The level of destruction, the death toll of civilians and the practices teach us that it gets worse and worse.’’ He takes issue with the use of artillery and the bombing of family homes of Hamas personalities, which the army says are used for command and are, therefore, legitimate targets. Mr Shaul says that even if Israel warns civilians to vacate areas to be targeted, that does not absolve it of moral responsibility for their fate. “If they don’t leave do they deserve to die?’’, he asked. While Breaking the Silence views the testimonies from the past as a way to understand the present, the army believes the group is rehashing old claims to embarrass it at a sensitive time. Asked about the allegations, Col (res.) Shaul Shay, former deputy head of Israel’s National Security Council and a scholar at the Interdisciplinary Centre in Herzliya, near Tel Aviv, told The Independent that the army “kept, is keeping and will keep high moral standards in all its Gaza operations. “To our sorrow, the approach of Hamas is to use civilians as a human shield and to war against our civilian population. The army adheres in an exceptional manner almost to the point of endangering our soldiers in order to try to have war with minimum civilian casualties. The more Hamas shelling builds shooting positions, tunnels and attack positions in built-up areas, the more the army is forced to fight there and from this there are [civilian] casualties”. He says steps to warn civilians to leave their homes go beyond anything the US or UK militaries have done. “Breaking the Silence has no case. It saddens me that Israelis make such claims at such a time, claims that serve the propaganda and psychological warfare of the enemy,’’ Mr Shay said. We began a week of practice on the ground, during which we talked with the officers commanding the operation. Pretty soon we realised that the idea was not just a campaign, but an actual war in which gloves were to be taken off. Considerations we were accustomed to hearing in briefings, like rules of engagement and attempts not to hurt innocents and the like, were not made this time. On the contrary, the attitude was, war is war. To paraphrase the brigade commander who spoke to us one day in the field… we were sitting around the campfire one evening, and he came and spoke with us about events in Gaza. Among other things, he told us what we should expect and how we were supposed to behave – he even brought up people who asked him about morality and innocents. His reply to them, and to us, in this regard was that this time it was war and we should have no second thoughts about damaging anything – including mosques, including any threat we feel, real or imagined. The approach is to open fire and to try not to consider the repercussions. At any obstacle – any problem – we open fire and don’t ask questions. Even if it’s firing in the dark, aiming at an unknown target – firing when we can’t see, deterrent fire – no problem with that. A vehicle that’s in the way – crush it. A building in the way – shell it. This was the spirit of things that was repeated throughout the training. We were positioned east of Beit Hanoun [north Gaza]. People are walking around in the streets with lots of children hanging about. I see kids on bicycles in a street where shells are falling and the children run around free. Not far from the houses was a major hit. And I see this kid riding his bike as if nothing happened, two meters away from him now. I don’t remember having been told about civilians there. Our mission was to shoot at sources of fire. It was very intense in both directions: the IDF strikes, I recall the shots. Crazy blasts. You keep seeing all of Gaza up in the air. The light it created, it was insane. There were combat helicopters up in the air constantly. There were drones with which we worked. There was gunfire from Gaza at all times – there was so much gunfire. We were working with X, giving the open-fire orders. We told him “we detect” – no one was actually firing. I don’t remember seeing a group of combatants, just flashes of rockets fired all the time. You see houses but it’s very difficult to detect a target. You can’t be precise – you can’t really aim. During Rainbow Operation, we sent two squads. The mission was to take over a house for stake outs. I commanded one of the squads; a friend of mine commanded the second squad. At the beginning of the briefing we are told that we have to divide Rafah from Tel-Sultan. A few days before the operation a Golani [infantry] force entered Tel-Sultan, did some job there and went out. The idea, as I understood, was that since Giv’ati [infantry] had to enter Rafah, and since they didn’t want the (Golani) operation in Tel-Sultan to have been for nothing, we had to enter and create a buffer zone. All around us there was destruction on a scale I had not seen before – of houses, greenhouses, and roads. Everything there just became a bunch of sand dunes. All the while, I am repeatedly asked by the force commander: ‘Why aren’t you shooting? What is going on? Why aren’t you killing anybody?’ Non-stop pressure. The problem with artillery fighting in an urban area is that one tries to be as precise as possible, but there are a million parameters at play: weather, the weight of the shell. I might have a high-explosive squash head that blows up and destroys a lot with that kind of weight, and then another shell of a different weight. If you don’t check the weight, you can have a 200-300m difference in range that may end up hitting a school instead of the target.